The Jews haven’t cornered the market on oil for the season. My house is still rancid from yorkshire pudding and roast beef. And last night, at a Boxing Day party, I was served pirogies, a Christmastime favorite for Christian Polish. 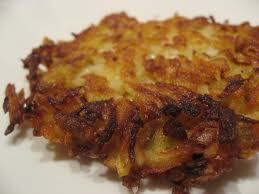 They have to beat latkes for fat: fried dumplings filled with cheese AND potato!